Letter from F. Douglas Lawrason, National Research Council, to LP RE: Travel vouchers are being sent to LP in order to reimburse him for his trip to Washington. Also discusses LP's conference on Oxypolygelatin. [Filed under LP Science: 14.028, Folder 28.1]. Letter from LP to Dr. Walter S. Vincent RE: answers Dr. Vincent's letter by sending copies of the papers on the structure of nucleic acids as he requested. Goes on to describe his future plans of work on the same topic. [Letter from Dr. Vincent to LP March 13, 1953] [Filed under LP Correspondence: Box #427, Folder #13]. I have just talked with Bill about the schedule for making the second edition of GENERAL CHEMISTRY. One point that I have mentioned is that we have been hoping to have the book for use in our own classes this fall. We are especially interested in having the new chapters, chapters 3 and 8, and this comes in the first term. We shall accordingly be disappointed if the book is not available by 1 October, but of course if the schedule does not permit the book to be published by that time we shall accept it. 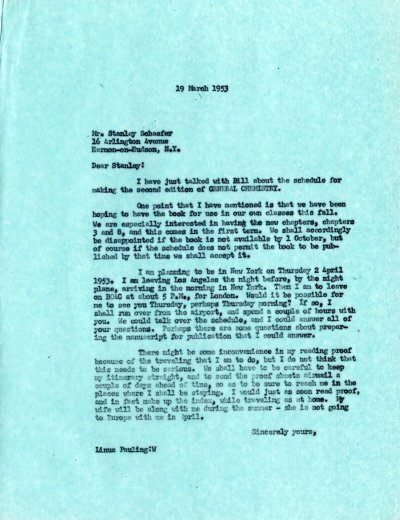 I am planning to be in New York on Thursday 2 April 1953. I am leaving Los Angeles the night before, by the night plane, arriving in the morning in New York, Then I am to leave on BOAC at about 5 P.M., for London. Would it be possible for me to see you Thursday, perhaps Thursday morning? If so, I shall run over from the airport, and spend a couple of hours with you. We could talk over the schedule, and I could answer all of your questions. Perhaps there are some questions about preparing the manuscript for publication that I could answer. There might be some inconvenience in my reading proof because of the travelling that I am to do, but I do not think that this needs to be serious. We shall have to be careful to keep my itinerary straight, and to send the proof sheets airmail a couple of days ahead of time, so as to be sure to reach me in the places where I shall be staying. I would just as soon read proof, and in fact make up the index while traveling as at home. My wife will be along with me during the summer - she is not going to Europe with me in April. Letter from LP to Tomoji Tanaka RE: writes that he has read the material that Mr. Tanaka sent him, and he does not really understand it. Says that he believes that the existing theory of atomic spectra seems to him to be satisfactory and does not need correction. [sent Mr. Tanaka's manuscript back to him] [previous letters from Tomoji Tanaka to LP March 8, 1953, March 20, 1953, letters and manuscripts of response from Tomoji Tanaka to LP April 8, 1953, April 30, 1953] [Filed under LP Correspondence: Box #410, Folder #18]. Letter from W.H. Taylor of Cavendish Laboratory to LP RE: enquires about what programs are going on at Caltech so as to not perform any research overlaps in their own laboratory. Mentions their current work on the structure of complex alloy phases. [Letter from LP to Dr. W. H. Taylor March 30, 1953] [Filed under LP Correspondence: Box #405, Folder #8, file: (Taylor, W. H.)].